"Hemorrhage is the leading cause of death on the battlefield, and one of our most challenging forms of hemorrhage has been junctional [the junction of the legs or arms with the torso] hemorrhage, or hemorrhage from deep wounds on which it is impossible to put a tourniquet or apply manual compression externally,"
Profuse bleeding occurs when blood vessels are ruptured. This is a very common characteristic of substantial physical trauma, such as a gunshot wound. Bleeding, whether internal or external has the potential to quickly result in death or at least permanent damage. Throughout history, the tourniquet has been a lifesaving measure for stopping bleeding during transport of victims to medical treatment facilities. Despite its long history of saving lives, the tourniquet cannot be safely applied in certain areas of the victim’s body. As Dr.Pusateri states in the opening quote, tourniquets cannot be applied for junctional hemorrhage and manual compression is not effective for stopping hemorrhage from deep wounds. However, RevMedx, Inc., a company out of Oregon has developed a new device called XSTAT to control bleeding from junctional wounds in the groin or axilla not amenable to tourniquet application. According to company literature, the XSTAT is a hemostatic device for temporary use up to four hours until surgical care is acquired. 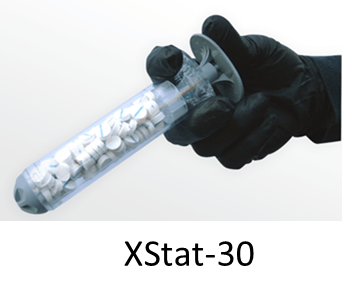 XSTAT works by injecting a group of small, rapidly-expanding sponges into a wound cavity using a syringe‐like applicator. In a wound, the XSTAT sponges expand and swell to fill the wound cavity within 20 seconds of contact with blood. This creates a temporary barrier to blood flow and provides hemostatic pressure. Each sponge contains an x‐ray detectable marker to aid in surgical removal. In a News Release published April 23, 2014 by the U.S. Army Medical Department, Medical Research and Materiel Command, Pusateri said "It is a capability that has never existed before, and can be used in the field setting by medics.” He added, "We have not identified any significant problems, and we expect it will fill a capability gap that we've had for quite some time. Upon FDA approval, the device will be commercially available off the shelf. I expect that RevMedx will do an initial production run." On April 7, RevMedX issued a press release stating that they had received approval from the US Food and Drug Administration. According to information provided by RevMedx, the compact XStat-30™ applicator includes a telescoping handle and a sealed valve tip. The telescoping mechanism allows the handle to be stored in a shortened state to maximize compactness. The applicator tip is designed to prevent fluid ingress and minimize the risk of premature sponge expansion. 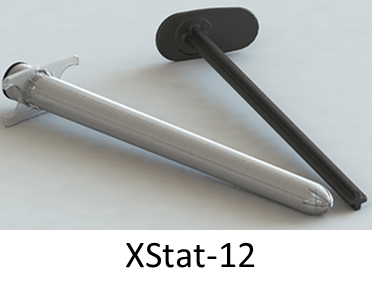 RevMedX is also working on a version of the XStat, this one called the XStat-12 for narrow wound tracks. According to company materials, the ﻿XStat-12™ applicator for narrow wound tracks is currently under development. The applicator body includes a frangible tip, a detachable plunger and a finger flange with snap-fit features to secure multiple devices for low-profile packaging and storage. CAUTION: Investigational device. Limited by federal law to investigational use.